CEO Nirav Tolia talks about the communications applications of the burgeoning hyperlocal social media network. 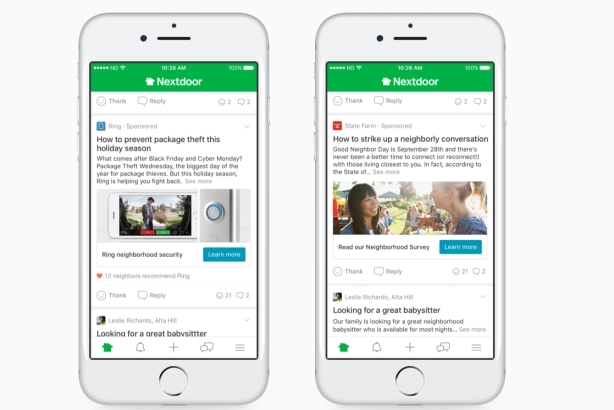 SAN FRANCISCO: Brands are beginning to rely on social network Nextdoor as they take a neighborly approach to engaging local communities. Launched in 2011, Nextdoor is a free, private social network that connects neighbors on a digital bulletin board of sorts. Its hyper-local focus is a differentiator from other social platforms, said CEO and cofounder Nirav Tolia. "Twitter is about what you say," he explains. "Facebook is about who you know. Nextdoor is about where you are." Billing itself as "a scalable version of the next generation Yellow Pages," Nextdoor allows neighbors to connect on issues from local businesses to gas leaks to lost pets. "That notion of community participation, that discussion, is unique," Tolia said. "And for strong brands, it really amplifies their value." About 10% of the conversations on Nextdoor are about crime and safety, opening opportunities for brands such as Ring, a video doorbell company made famous by Shark Tank, he added. Ring CMO Simon Cassels said via email that Nextdoor allowed his company to talk "naturally" to customers about its products, partly because of its "built-in targeting" as a community-focused platform. "It has not only helped us with brand awareness, but it has also encouraged neighbors to actually do more in their neighborhoods to keep them safe, many times starting a whole conversation about safety solutions," he said. "In those conversations, we can engage directly with customers by answering questions and gathering product feedback. In turn, we receive thousands of product recommendations in the markets where we have run sponsored posts." The company said earlier this month it plans to feature in-stream native units. Nextdoor is found in 129,000 neighborhoods, or about 70% of all neighborhoods in the U.S. In Europe, the company has launched in the U.K. and the Netherlands, and is found in 40% of neighborhoods. The social network declined to disclose its number of users. Nextdoor has raised $210 million in venture capital funding. Its last funding round in 2015 gave the company a valuation of $1.1 billion. Amelia Folkes, a PR brand strategist at State Farm, said her company used Nextdoor for its Good Neighbor Day campaign. "It provided an authentic way to connect with neighbors about something we feel is important to them: stronger and safer neighborhoods," Folkes said, via email. "It was an incredibly relevant way to share our campaign messages with a broad, yet targeted audience." During the six to eight months Nextdoor tested sponsored posts, Ring received an 8% engagement rate, .5% click-thru rate, and more than 90% positive sentiment score, encouraging the company to increase its budget on the social network by more than 400% this year. State Farm also leveraged the network’s sponsored posts "to poll members in 11 markets about how they connect with their neighbors," Folkes added.